Zom Living just paid $33 million for land along Federal Highway in downtown Fort Lauderdale, where it plans to build a 456-apartment project, property records show. Las Olas Company, a major property owner along the boulevard, sold the 17-parcel site between Southeast First Street and Southeast Second Court, on the east side of South Federal Highway. The company, managed by developer Michael Weymouth , started investing in the properties as early as the 1970’s, records show. On the site, Zom will build Las Olas Walk with two 8-story buildings connected by walkways, according to a press release. The project will also include 14,000 square feet of amenities on its ground floor and a 20,000-square-foot rooftop deck on the south building. Zom also plans to build a parking garage, according to a notice of commencement filed with Broward County. In total, the land encompasses nearly 150,000 square feet or 3.4 acres. The project is scheduled to break ground in the second quarter of 2018, according to a press release. Records show the Orlando multifamily developer scored a $91 million construction loan from PNC Bank. Just last week another developer also invested in downtown Fort Lauderdale, with plans for an apartment project. A partnership between Silverback Development and Bizzi & Partners Development paid $12 million for the site of their planned mixed-use luxury rental tower, New River Central. 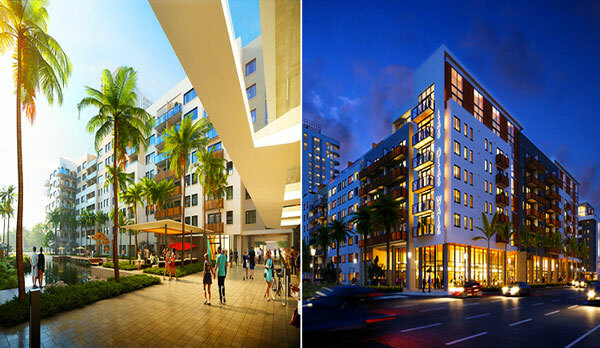 Photo is a rendering of Las Olas Walk credited to Zom Living.